Coming Home Tour with John Butler Trio+ underway + ‘The Sound of White’ and ‘On A Clear Night’ albums debut #1 and #2 on vinyl charts! 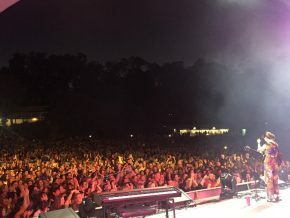 Hi friends, sending you a message from WA where we kicked off the Coming Home Tour with John Butler Trio+ last weekend! Such gorgeous crowds, and so many cute kiddies dancing front of stage! It’s been a truly magical week in Margaret River, especially spending some time with John and Danielle and their beautiful family and community. Yesterday we swam in water holes, sun-baked on rocks, dodged bull ant nests and Christmas spiders, ate homemade spaghetti with salad from the garden and laughed around an un-made fire. This has been good for the soul and so inspiring in so many ways, looking forward. Sammy has been in nudie heaven, running through the bush like a wild man. 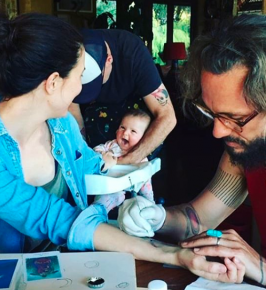 Then this arvo to top it off John Butler tattooed a beautiful little moon onto my wrist, to represent my daughter, my Luna. My squeezable little love. Now I have an arrow on my foot for my boy Sammy Arrow, and a moon on my wrist for Luna. What’s next I wonder… For now, we’re in Perth from tomorrow for two nights at Kings Park – the first night is sold out but there’s a few tickets left to the Saturday night show! Then we’re off to the east coast, doing a whole bunch of shows at iconic venues including Sidney Myer Music Bowl in Melbourne and the Sydney Opera House forecourt in Sydney. Only a few tickets left to these shows so get in quick… head to www.missyhiggins.com/shows! Also, please click here for children’s policies at each event. Also so happy to hear that ‘The Sound of White’ and ‘On A Clear Night’ debuted at #1 and #2 on the vinyl charts after their release last week! ‘The Sound of White’ even made it to the full ARIA Albums Chart top 20 for the first time since 2007 (!!!). There are only a few copies left of each album, head to www.missyhiggins.com/vinyl to grab them while you can!